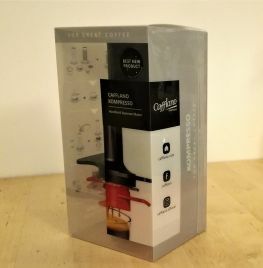 The Cafflano Kompresso is an authentic espresso maker with tamping scoop, and a hydraulic compression operation designed to maintain a high pressure of over 9 bar until the espresso is fully extracted. Watch the espresso form, pouring through the basket filter (a bottomless portafilter). Durable, hygenic, easy to use and clean. No filters to replace. The Cafflano Kompresso is a press type espresso maker.